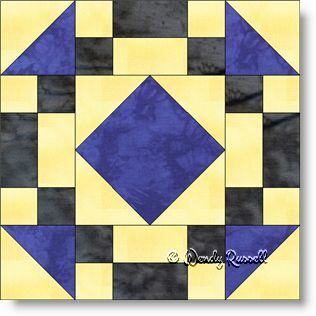 I decided to add the Checkmate quilt block to the intermediate category of blocks, simply because of the number of pieces in the blocks and therefore more seams. There is nothing difficult in the making of this uneven nine patch block other than being very aware of sewing a precise quarter inch seam allowance. The centre of this block uses the patch known as square in the square and that would be the most "difficult" patch (which is not at all). Half square triangles are used for the corners and the rest is comprised of squares and rectangles. Laying out the blocks into a design for your quilt is a fun process and as you can see from the settings illustrated, you can come up with many different looking quilts from the same block. You are only as limited as your imagination.